Hello and welcome to my blog; my second post for today is part of Kylie's International Blog Highlights. Please take a few minutes and vote for my card. Speaking of which I created a little watercolor card. 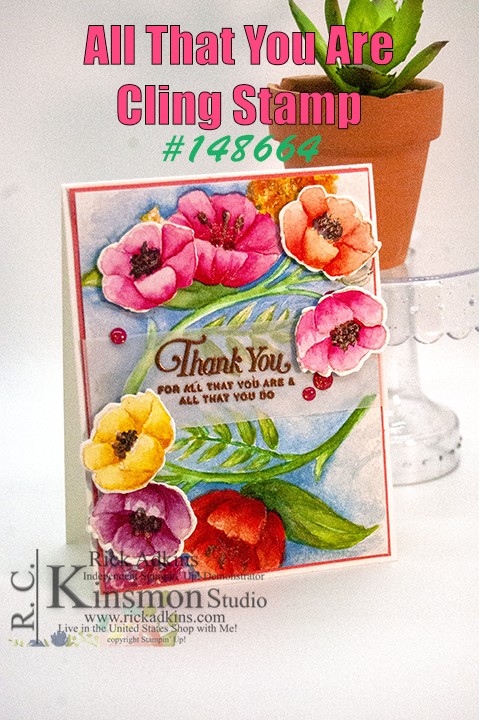 I used the All That You Are stamp Set for my card. Here's a little look at it. I started out by stamping the largest flower twice on a piece of watercolor cardstock. 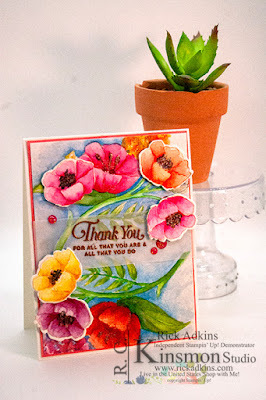 Next I stamped about five of the additional flowers from the stamp set. Once I had everything stamped I started the watercoloring process. Building up layer after layer until I had the desired hues and tones. After everything was dried I painted the background with a blue shade and set the card front to the side to dry. While this was drying I used the Frosted Bouquet framelits and cut out the medium flowers. Once everything was cut out I take a piece of vellum cardstock and heat embossed my sentiment on it using copper embossing powder. I then added the card front to a piece of Flirty Flamingo Cardstock and attached it to a Thick Whisper White Card base after wrapping my vellum sentiment on the front. At this point I could come back and attach the other flowers using stampin' dimensionals around the sentiment and other flowers. To finish off the card I added a few Glitter Enamel dots. Thanks for dropping by you can view the other cards for this month's International Highlights by clicking here. You can also vote for my card there also. Wow, wow, wow!!! Absolutely breathtaking, Rick! Fabulously vibrant Rick. Thanks for being part of my international highlights this month! All the best with voting. Gorgeous Rick, thanks for inspiring me.